We arrived to a friendly greeting from reception staff and given a map of how to get to our room,no help offered despite my husband being disabled.We found the instructions confusing and were helped to find our room by some fellow guests.The room was large with a bathroom suitable for disabled.We had a nice terrace by the pools but it never got any sun. There were two large pools one cold the other heated,there was also a children’s pool which I thought unsuitable as the sides were very steep making it difficult to get in or out of. The dining room was more like a canteen,the food was dreadful.A poor choice usually not very warm.The salad bar wasn’t too bad but most of the salads had meat or fish in them.As a vegetarian I found it very hard too find anything suitable,I usually ate potatoes and salad leaves twice a day.One day I had soup which said it was vegetable but was chicken,not a good experience. We started to go out to eat and had two wonderful meals at La Chicita. The town was about 25 minutes walk away and consisted of a busy main street of mainly “tat”shops selling the same things.There were also well known clothes shops. The sea front and harbour were pretty and we enjoyed drinks overlooking the sea,drinks in these places were more expensive. There wasn’t much more to the town. The airport was very well laid out and food and drinks reasonably priced but don’t expect to sit in a restaurant we only saw snack bars. Hotel tip: Rooms to the right of the pool don’t get sun. The Arena Suites Hotel met all our requirements and was the perfect break. The staff hotel were helpful, going above and beyond when we had any enquiries. The food was generally quite varied and a great fresh salad selection was also available with each lunch and dinner. The bar staff were great, always smiling and happy to see us. The entertainment seemed to change frequently from what was advertised each morning but this is beyond the hotel's control when acts cancel last minute. What acts we did see was quite varied including a snake handler and a fun duet. Our room was clean, spacious and well maintained. Apart from sleeping most of the time that we spent in our room we actually spent on our balcony where we could make the most of late afternoon sun. The pools were clean and whilst the water was a bit cold initially it was fine once you got used to it. My sister-in-law and I swam in it daily. We also made use of the hotel sauna which we highly recommend. As two girls we were concerned about the security and location of the hotel and resort and we wanted some support in choosing the right holiday for us. Our travel arrangements were sorted by Traveltext and everything ran perfectly taking any hassle out of our holiday. Hotel tip: The deeper pool is the one that generally slightly warmer. The hotel was rated a 4 star. This is because and only because it ticks the boxes for offering certain facilities like fridge, air conditioning, tea/coffee making facilities in rooms and having pools, Internet access, sauna and a squash court. This hotel did offer these facilities. The cleanliness of the hotel was for the most part excellent. The cleaning staff are very hard working and towels/sheets were changed daily. The pool area was kept fairly clean. The comfort factor in our opinion was quite low. The beds needed new mattresses and most of the soft furnishings and finishing touches needed replacing. The whole hotel needs a bit of TLC. The food choice I would say was just OK. There was some choice each day but quite repetitive. For breakfast the cereals are limited and the basic no frills type, plenty of bread & butter, preserves, fruit and yoghurt and of course the quite good, not so bad cooked English breakfast. Lunch and dinner pretty much the same. Choice of drinks was quite good. Tea, coffee, hot chocolate, soft drinks and alcohol, although, no bitter at all (much to the dismay of my husband). 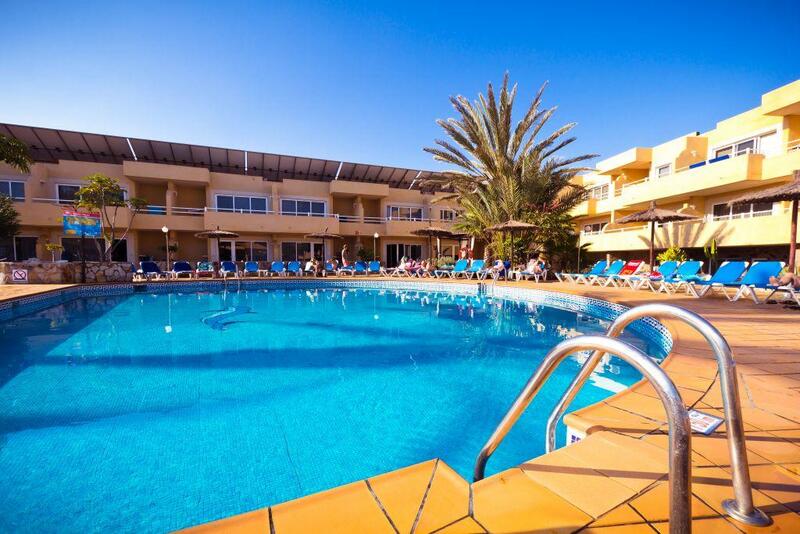 The hotel is a good walk away from the main town of Corralejo, about 35 minutes and we don't walk slow. The beaches are a little nearer about a 15 minute walk. The town has a selection of shops but mainly consists of trinket and souvenir type shops with an abundance of bars, grills and restaurants. The entertainment provided in this hotel is abysmal! Please, please please Hotel Arena, improve on this and I will definitely come back! We booked this hotel because it was half board, but when we arrived we found that everyone was on all inclusive. There was only one bar and one supermarket within walking distance. The commercial centre which was a little further, had a supermarket and a few restaurants. In the centre there are a wide range of shops, bars, and restaraunts. Beer was EUR2.50 a pint which was good. The hotel rooms were spacious but did not have any drawers and not much hanging space for clothes. The food was not very good, but you would not starve. The hotel was ok but the restaurant was awfel. There was not enough restaurant staff at the weekends, plates and spoons constantly running out and they were not being replaced until someone had asked for it. Everyday there was chips and fish was mixed with everything.... yuk!.... Very poor food hygine for vegetarians. There is no proper seperation for veggi food products and non veg. Same serving spoons were used for veg and non veg dishes. Vegetables were cooked on the same gril just after cooking meat / fish. There was poor choices for vegetarians. We had to eat at the local restaurants. We found a very nice and tasty indian restaurant which had just been opened when we got there. Anyone staying in Correlejo must try the restaurant, its called 'Amber' 25m from the main street round from Caixa bank. The food was freshly cooked, there was a friendly atmosphere with excellent service. They also have lots of choices for non vegetarians. Just returned from our stay at the Arena Hotel, Corallejo, I will try and give as honest a review as possible. I must first add that at times the weather wasn't great and this might influence things. This was our 5th stay at this hotel, we love it because its quiet and peaceful which is good when you lead a busy worklife. It was the first time for my sister and her husband. The staff were good in the restaurant.the manager was great. The staff on the reception were ...so so I did ask for the TV to be checked 5 times, they didn't even come back to tell me what was wrong with it, I know it's only a litytle thing but it would`nt have hurt them just to leave a note in our room or something. The entertainment was so so not much really. But we still had a great time. The beaches were near by and we went there everyday. We would go back again. But at the moment I don`t want to see another chip!!!! !